Thanks to all those who came along to our Home Beekeeping presentation at Enliven cafe a couple of weeks ago. Feedback was great and we look forward to seeing more home gardeners taking up beekeeping in Adelaide! 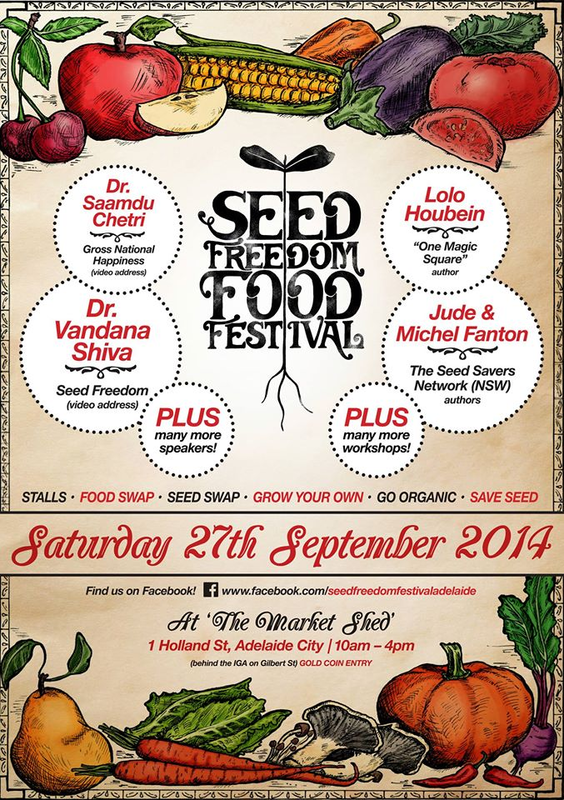 Permaculture Design for Home Food Gardens – FREE this Saturday, 27th September 10.30am at the Seed Freedom Food Festival in the city – See the full festival program here and the poster below – lots of other workshops and speakers to check out too! 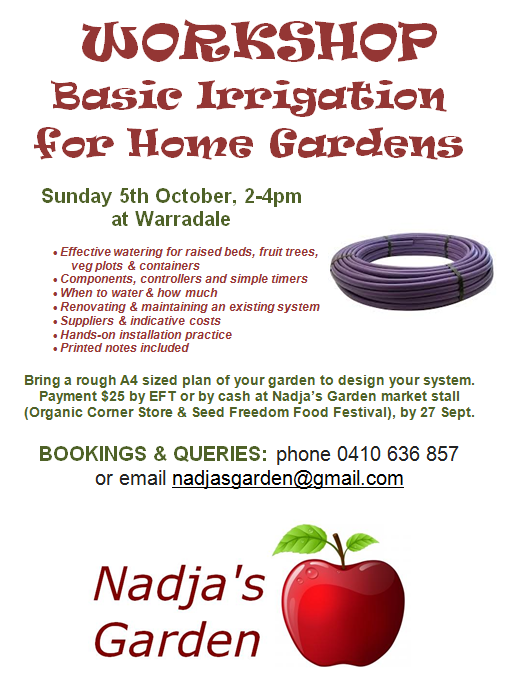 Basic Home Garden Irrigation – Next Sunday, 5th October, 2-4pm at Warradale – see flyer below. $25. Bookings (with payment) close this Saturday. Email me at nadjasgarden@gmail.com for details to pay by EFT, or pay in cash at market stall on Thursday (at Organic Corner Store) or Saturday (at Seed Freedom Food Festival) – WORKSHOP CANCELLED DUE TO INSUFFICIENT ENROLMENTS – ENJOY THE LONG WEEKEND! Introduction to Permaculture – a one-day small group workshop to make sense of the ethics and principles of permaculture, and to provide a taste of the intensive Permaculture Design Course (PDC) that started in Australia and is now taught around the world. This intro course is being road tested this October with a select group of teachers and gardeners, before going live early next year. If you’re pondering doing a PDC or have always wondered what permaculture is all about, this is a great way to check it out in a fun group setting. Early registrations of interest for 2015 are welcome – more details to come in the new year. Nadja’s Garden events & workshops are updated regularly on the Facebook page … and to subscribe for email updates you are welcome to join the mailing list. Email nadjasgarden@gmail.com. This entry was posted in community, courses, events, markets, permaculture design, permaculture principles, resilient gardening, spring. Bookmark the permalink.